RRCD Signs Agreement on Cooperation with PAO "BANK URALSIB"
On October 2, 2017 JSC "Ryazan Region Corporation of Development" signed an agreement on cooperation with PAO "BANK URALSIB". According to the official website of the Ministry of Economic Development and Trade of the Ryazan region, on September 7, the opening ceremony of the children's technopark Druzhba of the federal Kvantorium network was held in Ryazan. The official website of Ministry of economic development and trade of the Ryazan region published congratulation on 5th Anniversary of Ryazan Region Corporation of Development. On August 23, 2017 JSC "Ryazan Region Corporation of Development" signed an agreement on cooperation with LLC "Pharma-Logika-R". 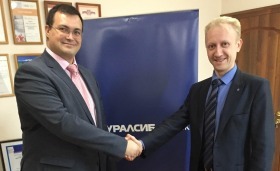 On August 21, the head of the Ryazan region Nikolay Lyubimov signed a number of cooperation agreements with PJSC “Pharmimex”, LLC “Eco-Zoloproduct. Invest”, LLC “Ryazan Vegetables” and LLC “PG Samotlor-NN”. On August 16, the branch of PJSC "OGK-2" - Ryazan GRES, was visited by Yuri Ivanov, General Director of Ryazan Region Corporation of Development. This visit was caused by his interest to the largest enterprise of the region and further strengthening of relations with the purpose of developing the region and attracting investors. "Investment support for small and medium business in the Ryazan region" seminar organized by the Regional Entrepreneurship Support Center was held in Shilovsky Business Support Center. Meetings of expert groups on introduction of target models for simplifying business procedures and increasing investment attractiveness of the Ryazan region were held at the site of the Association of Young Entrepreneurs of the Ryazan region. Questions about creation of monotowns in the Ryazan Region were asked by representatives of regional media during a regular press conference of Nikolay Lyubimov, the head of the Ryazan Region, which was held on Wednesday, 2 August. On July 26, Strategic Development Concept of the Ryazan Region – 2030, developed by the Russian Academy of National Economy and Civil Service under the President of the Russian Federation, was discussed in Ryazan.